What does it mean to be the No. 1 pick this year? Wilson: It’s such a great feeling. It means a lot to me to just kind of cap off my collegiate career with this. This is a great class. Just to be at the top, [it] really makes my heart warm. 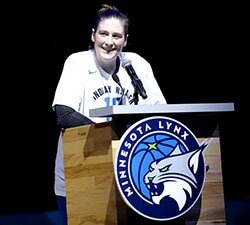 I’m pretty sure you could see my heart pounding through my jumpsuit when [Lisa Borders] was announcing [my name]. This is a great feeling. The nerves are gone now. It’s truly a blessing. Have you had a chance to talk with Aces head coach Bill Laimbeer yet? What are your expectations to play with him in Las Vegas? Wilson: I haven’t really had the chance to really talk to him. I’m pretty sure his expectations are kind of the same as Coach [Dawn] Staley’s. You have to come in and be effective as soon as possible. That’s something I have to be ready for. I have to get my body right. Have to get my mind right because this is a whole different league. So, I think his expectations are pretty similar. He’s expecting me to do the things [that I did] in college to make him want me. So, I can’t get really down on myself at times. I just have to keep pushing through. When you were a child, you didn’t want to play basketball. What do you think was the turning point for you? Wilson: The turning point for me would be that I hated people having fun with winning and I didn’t contribute to the win. So, I wasn’t having fun. My way of having fun was getting out there, having fun and actually playing the game. What matchup are you looking forward to? Wilson: I’m looking forward to [Dallas Wings guard] Allisha Gray. I’m looking forward to playing against her. I probably won’t guard her if that’s technically a matchup. That’s my roommate and my best friend. I’m just going to love to see her in the league. Is there any area of your game that you have to improve to become successful in the WNBA? Wilson: Become very consistent with my outside jumpshot. I think people are really going to try to play me for the drive. They’re going to scout me like crazy. With me, it would just have to be being consistent and stuff like that. 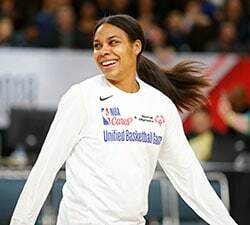 How do you feel that your experiences with USA Basketball will help in the WNBA? Mitchell: I got a lot of true experience with USA Basketball. Watching vets like Sue Bird and Skylar Diggins-Smith. They kind of showed us the ropes. I’ve enjoyed every part of it. In particular, how the game goes. What to do. What to not. The persona. The body language, being open to learn. Knowing that, that aspect alone will help me a lot in the long run. Mitchell: It’s really exciting. I was kind of able to look back at things. I want to go to a team like open. Going to that program and being able to talk to Coach Pokey about any and every thing — her helping [me] and teaching me everything will help, too. How did it feel to have your name called? Mitchell: It was kind of crazy. I was sweating a lot. It wasn’t like that at first. We were kind of chilling. The closer it got, the more intense it got. Once my name was called, I was kind of like jittery. How do you think you’re going to fit in with the Indiana system? Mitchell: Hopefully, I do. I haven’t met them, but I know they’re all great players and come from great programs on the collegiate level. I’m looking forward to that. What are you most excited about going to Indiana? Mitchell: I’ve been there before so I’m kind of familiar with it. Hopefully, I won’t get too lost. DeShields: First of all, the location – I’m happy with that. I’m happy where I’m going. I already have a relationship with the head coach [Amber Stocks]. I’m looking forward to working with her and I’ve also gotten to know Gabby [Williams]. So, I think those are just my first impressions so far. I think I have a pretty good feeling for them and they have a pretty good feeling for me. So, I’m looking forward to it. Can you go into a little more detail about your relationship with Coach Stocks? DeShields: Amber actually came out to Turkey to come see me. Obivously, that meant a lot. Her being the only coach to take out the time and put the extra effort to come all the way out there. So, it meant a lot to me. Amber is actually my trainer’s sister-in-law. I didn’t know her prior to this year. So, that connection kind of just happened on its own. How much did playing abroad help grow your game? DeShields: It just gives you that chance for trial and error. I think I’ve been able to polish my game way more than I ever could have on the collegiate level. So, moving into this WNBA season this summer, I think I’ll come in way more prepared than I ever could have had I not done it this way. Adding you and Gabby along with Stefanie Dolson, does it feel like pieces are falling in place in Chicago for you? DeShields: It’s just nice to have super talented players at each position. You have Stefanie [Dolson], Gabby, Allie Quigley and Courtney Vandersloot at the point – incredible. I’m just looking forward to getting out and learning from those guys. Building that cohesiveness, I think that will lead to up to a lot of success in Chicago. Has Coach Stocks spoken to you about the way you fit in that system? DeShields: No, we haven’t talked about it. I think that she is kind of a mysterious kind of woman. Now that the door is wide open, we’ll have those conversations and get to know each other a lot better. You’re a member of the Chicago Sky. What was going through your mind when you heard your name called? Williams: My heart was pounding the entire night. I just hugged my mom and said we did it. It’s been a long journey. Just to finally hear my name being called, it was amazing. Can you talk about the range of emotions from playing in The Final Four 13 days ago to having this night tonight? Williams: It’s been a whirlwind. Preparing for this draft and everything that comes with it, it’s been a good distraction for me with everything that has happened. Now, I’m just on cloud nine. What will you bring to the Chicago Sky? Williams: I’m trying to bring some defense, be a playmaker for them and just make some things happen for my teammates. Did you have expectations for where you might go tonight? Williams: I didn’t. Maybe I should have, but I was so nervous the whole time. I was running every scenario through my head, the good ones and the bad ones. I was trying to text my mom and she was just telling me to breathe and pray. I didn’t know what was going to happen tonight. How does it feel to see UCONN players get drafted tonight? Williams: That’s awesome. That says so much about the program. Teams want UCONN players and that’s because what Coach [Auriemma] has done and how they developed us. I went to that program because I knew I was going to get better. How have you gotten through the recent weeks? Williams: Prayer. Prayer, a lot of water and not much sleep. 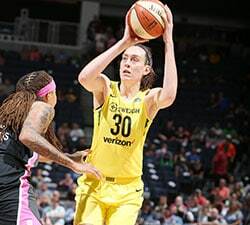 When you heard it was Seattle, was playing with Sue Bird one of the first things to pop in your mind? Canada: Yes, I love Sue Bird. She’s one of my role models. I enjoy watching her play. The way she leads her team and is able to create for others. That’s something I really want to learn from her and just continue to grow my game through her. Just the fact that I get to play with her, it’s just a blessing. What is the biggest thing right away from a rookie point guard? Canada: I think just getting stronger. I think that’s the biggest thing. You know I’m very small so being able to play against bigger and stronger guards, that’s going to be a challenge for me right away. Just making sure I’m staying healthy and getting stronger every day. Is there a better veteran to have on your team than Sue? Canada: There’s so many, but I think Sue sets the standard. Why not learn from somebody who has the highest expectations? I’m just ready to learn from her. How have you survived the past few weeks with the WNBA Draft Process? Canada: Luckily, I finished school early. So, I was done right before we went to The Sweet 16 so I was just able to focus on basketball. Now, that season is over. Just trying to relax and take as much time off as needed. Now, [I’m] just getting back in the gym. Is it fun for you to stay on the West Coast? How does it feel to be drafted by Dallas? Stevens: Really excited, honestly. I’m just excited to get there and work with the team and the staff. It’s honestly just surreal. I’ve dreamed of this moment since I picked up a basketball, so for it to actually be happening is pretty amazing. It’s the twin towers with you and Dallas center Liz Cambage. Is that going to be a neat thing? Stevens: It’s going to be awesome. She’s a really talented player. She’s really big, too. It’s going to be nice to be able to learn from her, honestly. She’s a great player. I think her game and my game will complement each other well. Stevens: I think it’s something I’ve always been working on. I’m definitely excited to bring that aspect of my game to this team. How did playing at UConn and Duke help prepare for the WNBA? Stevens: I think it’s helped me be able to adjust. Going from one program into another program, it was hard to kind of let go of everything that was there and immerse myself into a new place. So I feel really confident going into this team to be able to adapt and adjust to the new environment and the team and whatever they need me to do. What was it like when you heard your name called? Vivians: My heart was pounding like really, really hard. I looked down and could see it out of my shirt. It was pretty amazing. I was just ready to get it over with. What have the last two years been like for you? College career ended a little bit short, losing to Notre Dame in the championship. So what has it been like? Vivians: My college career didn’t end short because I played until the last game. We just didn’t end up with the win. But the past couple of weeks have been kind of hectic. I’m still in school interning and trying to meet with agents and talk and just try to get everything together before this day. It’s been kind of overwhelming but I’ glad it’s her now. Vivians: It feels just like I’m going to be on my college team again. I had scorers around me, so it’s going to be just like I’m in the same situation again and helping each other play well together. And I’m hoping we have great chemistry. Have you talked to Indiana head coach Pokey Chatman at all? Vivians: Yeah, I talked to her on the phone. We both are pretty excited. I know she really wanted me badly. I’m glad she got me and I’m glad I’m with her. Brown: Honestly, finally. It was a relief. Waiting out there was nerve-racking. Having my family by my side definitely helped. To have my name called is like my dreams are coming true. I wanted to cry, but my makeup, so I didn’t. What do you know about the Connecticut Sun? Brown: I know that they’re a team that’s on the rise. A lot of young talent. Super excited, I loved watching them play. They like to play fast. They like to play defense. I’m just excited to be apart of the core they’re building. Where did you get your basketball prowess from, mom or dad? Brown: A mix of both. The skillset from my dad but the attitude and spark I have definitely came form mom. Brown: The conversation I had with coach was awesome. He asked me what outfit I was going to wear, which I really loved that. He described to me what he’s going to need me to bring to the table if I end up on his team. He told me I might be a role player for a little bit and if I could handle that. Absolutely I’ll be able to handle that. I want to bring as much positive energy, defense and scoring, if necessary to this team. New York is a team that needs perimeter, defense and scoring. Does it seem like a really good fit for you? Nurse: Yes. Absolutely. The conversations that I’ve had with them, watching them over the last couple summers, I think it’s a place I fit in very well and I’m very excited to get started. Are you happy to go to New York? Did you think you’d go to Connecticut? Nurse: No, if you ever get the opportunity to go to any kind of draft in your life, it’s wherever you get to play, wherever somebody picks you. I think I feel most fortunate and most blessed to have the opportunity to play in New York. Was this about the fit of the team that picked you as opposed to the number you got picked? Nurse: Absolutely. I think for me, personally, it wasn’t about what number you get to go. Anybody can go at any number and any team. I think, with me, it was about going to a place I not only was wanted but a place where I could fit in really well and I could take and learn that each and every day. Nurse: Not a whole lot of conversations about [where I’ll fit in and play]. It’s probably a conversation we’ll have now. But definitely just need to play within myself and play within my strengths and then continue to work on the weaknesses that will translate into the WNBA. This is a really good place for you to play. Can you just talk about that? Billings: Absolutely. My agent was telling me that it’s a really good fit. I know that wherever I end up, I’ll be utilized. I know that there’s a reason that I ended up in Atlanta so I’m really excited and ready to bring a championship home to “The A”. What do you think the biggest thing is going to be? Billings: Just increasing my strength and being able to increase my speed, too. Just to be unstoppable. Working on my three-point shot. Just everything. Are you more comfortable at the three or four? Billings: I think I could play either one. I think I’m going to have to play either one. So, I’m looking forward to that challenge. What was going through your mind out there? Billings: Definitely nerves. I knew that wherever I was going to end up, there’s a reason. God has a plan. I just kept that in my mind. I’m really just thankful. Thankful to be where I am. To be sitting in this room with such great players. At the same time, I’m motivated to work. I’m hungry. I’m ready to go and get it. How does it feel to have your teammate drafted on the same night? Billings: That’s a blessing as well. Having Jordin with me is like having my sister with me. We got dressed together today. We got ready together. Helped each other. She’s just a big supporter to me. I support her. So, it’s just a level of comfortability that we have amongst each other.